The question has arisen from several sides lately regarding what is help, when to seek help, when help is not helpful but hindering. Some of this depends on the agenda of the person helping: do they wish to move you forward in your life, do they wish to impart information you don’t have and alleviate unnecessary suffering? Or are they trying to lessen your pain so you quit taking it out on everyone else but aside from that have no real interest in your well-being? All of these are fine, I think, although the last one will leave you feeling a little odd as the motive is nothing to do with you. What does not work and only backfires is the “helping” which is predicated on the need of the helper to be useful and to perceive him or herself as better or one-up on the helpee. It draws us into the Karpman drama triangle, where the helped person must be viewed as victim, there must be a persecutor, and the rescuer is more likely than not to take on the persecutor role at some point. Equally often, the victim gets tired of being considered victim and flips into persecuting the rescuer. All very messy. Feelings are hurt all the way around and no real resolution occurs. Generally, everyone walks away with whatever world view they held going in feeling confirmed for them, and everyone feeling ill-used. Real help by contrast feels supportive and freeing. It is something you are at liberty to respectfully decline. It adds to your power rather than taking away from it. These are people who ask first, “would you like help or feedback with that or are you just wanting me to listen” before they volunteer solutions or step in to do anything on your behalf. Another “help” issue which has arisen for me lately is when to ask for help in areas I consider my own specialty-when, in other words, to admit that personally I’m in over my head and become willing to accept help. I had a steep and good learning curve with that this morning. (Thank you, Ed!). No matter how gifted a healer one is, there is a time and a place to turn to others and accept assistance. I am most grateful this finally occurred to me today. Tags: help, Karpman drama triangle, rescuing | Permalink. and surrogate mother. She knew me from the age of about two, at least until the last few years, when she didn’t know me at all and asked her husband “who is that, why did you bring her here? I don’t like her.” I wept. The last time I saw her she was asleep and while the nurses asked if they should wake her up, I said no, she will only yell at me. Then I wept again, right there in the hall of the nursing home. As I did not cry for my own mother. This was the woman who first told me it wasn’t my fault my mother was sick; that I was not crazy, that I was a good person. She was the only one for some time. about me at all.) The end of life of one of the people who has held my story the longest means that parts of my story are forgotten, but it also gives me an opportunity to let go of the story I have come to identify as me. who was put upon and sad. She never once gave me nice clothing, any more than my mother did. There was nary a birthday or Hannukah gift; she bought my mother’s line completely that nice things were not for her children. She did take me to the symphony a few times, but there was never a shirt or a sweater or a piece of jewelry like you might give a girl child you called close as relative to you. I had never thought of this, until I wondered why I’d never sent her a present, except for one bouquet of flowers. And a Medicine Buddha talisman, which she scoffed at. Now that Lil is gone, I have an opportunity to stop being “poor Amel” who needs a rescuer and someone to feel sorry for her. I am not the girl with the sick mother who is always a little out of place and underdressed and too quiet for her own good. I am not the trapped one who only has friends who feel sorry for her. I may even be deserving of nice clothes, not from Artie’s Secondhand and Irregulars(it doesn’t matter, you can hardly see it) clothing store, but from this year’s rack of new designs. Maybe. Maybe I will have friends who do not think they are doing a public service by befriending me; who can enjoy my company without thinking they are saving me from someone else who has done me wrong. That would be nice. Who are not trying to be a hero; who are not trying to be anything but who they authentically are. This article was conceived in the spring, and got lost over the summer in the “to publish” folder, so you will read about yarrow at a time of year when you can’t easily go pick it. Hopefully it will give you something to look forward to. Come spring , the feathery yarrow sprouts will be coming up out of the ground, and the pink, yellow and white flowers will follow in summer. In my garden, I have many herbs I planted from seed, a few gifted, and a few bought plants. Oregano, rosemary, lavender, dill, fennel, sweetgrass, white sage, coriander have all graced my yard over the years. Most are still there. Of all of them, the only one I regretted buying was yarrow. Not because I don’t like it or find it useful, but because I had to laugh out loud at myself when I brought it home to plant and found it growing wild in the yard already. Yarrow is found all over Seattle in white, pink, and yellow flowering varieties; some in gardens, some volunteering. It is one of the herbs which has a rich medicinal use history in Native American and European herbalism . In addition, it is used in the Western magical traditions and is immortalized in British poetry and folklore. Gerard tells us that yarrow is the same plant with which Achilles staunched the bleeding wounds of his soldiers. Others say that it was discovered by Achilles, Chiron’s disciple. Yarrow grows everywhere, in the grass, at the base of trees, in meadows, by the roadside. It’s stalks are used in throwing the I Ching in China. It flowers from June to December, according to Grieves, although I’ve not seen a bloom past September. The stems are hairy, it has many fine leaves and a cluster of flowers(see pic). It spreads by root and seed. Yarrow was much esteemed as a vulnerary, for stopping bleeding. “The Highlanders still make an ointment from it, which they apply to wounds, and Milfoil tea is held in much repute in the Orkney’s for dispelling melancholy”(Grieves, Modern Herbal) It has been called Nosebleed for its property of staunching nosebleeds, although it is also attributed with the ability to cause a nosebleed. “…there is a curious mode of divination with its serrated leaf, with which the inside of the nose is tickled while the following lines are spoken….’Yarroway, Yarroway, bear a white blow, If my love love me, my nose will bleed now”(Grieves). There must be an easier way! 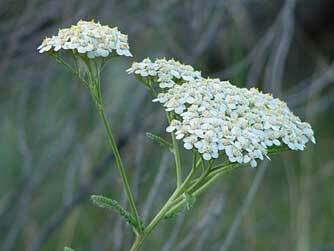 Yarrow was used by Native Americans for digestive troubles and headaches, as well as for staunching wounds. It was employed as snuff in Europe, hence Old Man’s Pepper. In the 17th century it was used in salads. Yarrow tea is a good remedy for severe colds; a decoction for kidney disorders. The bruised herb is used in Norway for rheumatism, applied topically. Yarrow is attributed to Venus in other sources as well, and is used in her oils and incenses. It grows wild around the Pacific Northwest and can be bought if you must. Pink, yellow and white are common. The flowers and leaves can be easily gathered without killing the plant, so there is always more next year. It is near impossible to kill if you are looking to learn to garden and haven’t yet developed a green thumb. I will leave you with a poem from Carmina Gaedelica, that treasure trove of Celtic folkloric poetry assembled by Alexander Carmichael in the 1880s. Freedom to Visualize the Postive.